Your time, caring, and wisdom can transform children's lives, and yours! If you’re a senior age 55+ living in Boston, Cambridge, Everett, Malden, Medford, Melrose, Somerville, Stoneham or Quincy and you can commit to a minimum of 15 hours per week, we encourage you to apply to become a Foster Grandparent. Small stipends are available on a limited basis. As an older adult, you’ve been through your fair share of joys and struggles. Now, consider sharing your wisdom, time and support with infants and children facing extraordinary challenges including poverty, learning disabilities, and even homelessness. 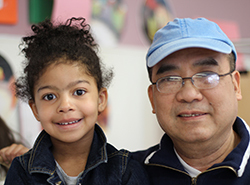 Join our group of Foster Grandparents who are making a lasting difference in children’s lives every day. We match Foster Grandparents with infants, toddlers, preschoolers and school age children in public/private schools, daycare centers, hospitals, and Head Start sites. Your mentorship, guidance, and companionships give kids the confidence they need to succeed–to beat the odds and overcome academic challenges and other obstacles. At the same time, the program gives you the opportunity to get out of the house, use your talents, and make a difference. ABCD staff supports each Foster Grandparent through easy-to-understand training in child development and early education. Each month, ABCD hosts a 2 to 4 hour training in which Foster Grandparents learn strategies for positively influencing your “grandchildren’s” self-esteem, emotional well-being, social skills, and academic progress.